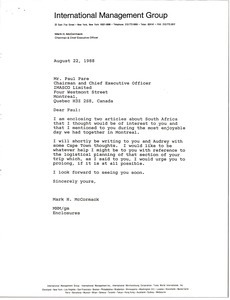 South Africa - McCormack sends Paul Pare two articles about South Africa that he thought would be of interest to him. He indicates that he will be shortly writing Pare and Audrey with some Cape Town thoughts. Attached are two articles pertaining to South Africa.